The 2018 season is over for the Baltimore Ravens, and it is time to begin the yearly roster evaluation. This year, we will go through all 10 positional groups and evaluate the state of the group, and make recommendations on what the Ravens need to change this offseason. In today’s article, we will take a look at the wide receivers corps. Here are the six wide receivers that were on the 2018 roster. The Baltimore Ravens have a long laundry list of moves at the wide receiver position to make this offseason. The very first move the Ravens need to make is to mutually part ways with John Brown. Brown excelled early in the season with Joe Flacco at quarterback. His deep threat ability paired with Joe Flacco’s cannon arm was an outstanding combination. However, Lamar Jackson’s skillset as a passer is quite different from Joe Flacco’s, and it showed on Brown. Brown’s production plummeted after Jackson took over as passer, and Baltimore likely won’t see it again should the team move to retain Brown. Brown could command a decently sized contract on the open market, and the Ravens have no real reason to pay top dollar to keep him around. It is simply best for both parties to move on. After coming to this conclusion with Brown, the Ravens will then need to determine what to do with Michael Crabtree. Crabtree was brought into Baltimore with the hopes that he would become the team’s leading wide receiver. Despite the high hopes and big paycheck, Crabtree struggled more than a true number one receiver should. Dropped balls plagued the season, and Crabtree even cost Baltimore a game in Cleveland by failing to catch a game-winning touchdown pass. The Ravens can cut him to free up $4,666,665, but the team would incur a $4,666,668 dead cap hit penalty. To cut Crabtree, the Ravens would also need a contingency plan that names better and cheaper candidates to replace him. This may prove problematic, as the wide receiver market is not very deep this year. If/when the team moves on from Brown and/or Crabtree, Baltimore will need to decide who to bring in to fill the positional voids. If the Ravens do move on from John Brown, I would suggest the team target New England Patriots wide receiver Phillip Dorsett. Dorsett is a speed guy that can come in and fill the downfield threat that John Brown provided the Ravens, for a much better price. Dorsett may not have the pair of hands that Brown has, but his role in the offense is likely to be minimal anyway. He may only see 1-2 targets per game. If the Ravens are looking to save money by cutting Crabtree, they will be hardpressed to find anyone on the open market that could do that. Big time receivers like Golden Tate and Adam Humphries are projected to make over $10 million annually on their next contracts. If Baltimore wants to find a replacement for Crabtree in 2019, the team will need to look to the draft, or gamble on a lower end free agent, like Kelvin Benjamin. Do the Ravens Need to Draft a Wide Receiver? Despite popular belief, wide receiver is not a pressing need in the draft for the Ravens. Baltimore has two receivers entering their second year, and one entering his fourth. Baltimore should focus on developing the receivers that are already on the roster, and should only add another receiver if there is a spot to fill. 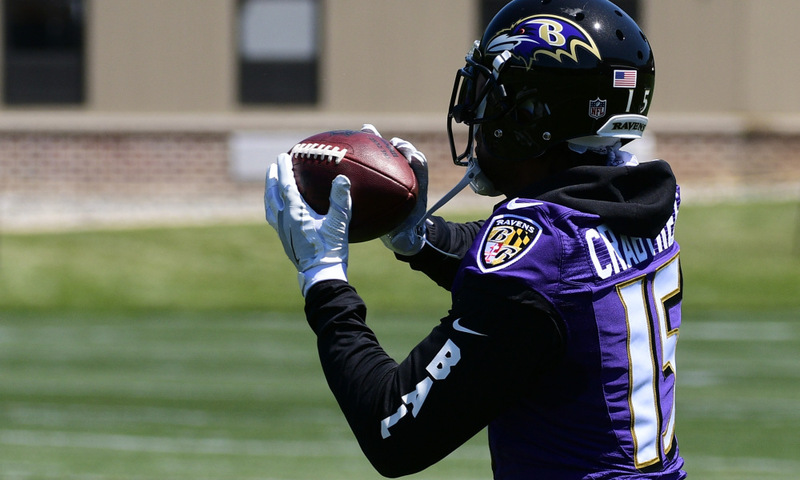 If Baltimore cut Michael Crabtree this offseason, the team would need to draft a wide receiver, as it is the only economical move that would make sense. If Baltimore only parts ways with John Brown, however, the team could find his replacement in free agency.